← Kundalini Yoga – Part 2: Psychic Body and the Chakras(lotuses). We discussed and understood the psychic body and chakras in the last post. Now, let us learn how these are connected to our body. When our body is created, supreme consciousness, Lord Shiva enters the body at the crown center i.e. Sahasrara. Lord Shiva’s better half, Shri Parvati Devi(a.k.a Shakti) then assumes the form of Mahamaya(Great illusion) creates the body from subtle to the gross. In other words, subtle principles(tatvas) like mind, ego and intellect are created first. Then, our gross body is formed from five elements(pancha bhutas) viz. Earth, Water, Fire, Air and Space. She distributes the karma of the person throughout Sushumna and lotuses before going to Muladhara. At Muladhara, she is referred to as Devi Kundalini. For all normal people like us, Kundalini sleeps as a serpent in Muladhara. Although, she is spiritually asleep, she is all powerful and controls everything in us. The awakening of Kundalini is the first step in Kundalini Yoga. She can be awakened in us by various means including practice of hatha yoga, mudras and bandhas. Safest and the best method of awakening Kundalini is by the Grace of a Realized Master(Sadguru). The special power of Sadguru is that- he can transmit his spiritual energy to awaken kundalini in a qualified disciple. This transfer of spiritual energy is called Shaktipat(descent of Shakti). Shaktipat can happen by a touch or a kind look or mere will power(sankalpa) of the Sadguru! Shakipat can be given by a Sadguru remotely(sitting several miles away) just by a thought, or by sending a fax, e-mail or a phone call. Moment the disciple reads the fax Kundalini gets activated in him! At the outset, it looks very mystical. There is no magic here, if we think about it. Why? Remember, the supreme Shakti is all powerful and beyond time and space. So, distance(several miles) and medium of transmission(fax etc.) of energy do not matter at all. Shaktipat is analogous to lighting a lamp. The Sadguru lights the spiritual lamp in the disciple by his own glowing spiritual fire. Sometimes, Kundalini is awakened spontaneously in some people, especially after near death situations. Uncontrolled awakening like this often results in mysterious physical and psychological issues in the person. Before we move further, it is important to understand some teachings of our scriptures, the Shaiva Agamas(Philosophy of Shivaites, i.e. followers of Lord Shiva). The Universal Self is also called Shiva. Shiva’s dynamic aspect is his consort, Shakti (also known as Paravti, Devi, Durga etc.). This is slightly abstract. Let us go by some analogy. Shiva is like Sun and Shakti is rays. One more – if Shiva is fire, Shakti is burning power of fire. Got it now? Shiva and Shakti are one and the same and always together. Extending the earlier analogy – Sun and his rays are together. The Sun rays cannot be separated from the Sun. Similarly, burning power cannot be separated from the fire. So, Shiva and Shakti are inseparable. Because of this nature, they would like to be together always. 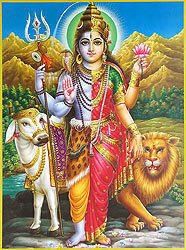 Oneness of Shiva and Shakti is a very important concept in Kundalini Yoga. This explains why awakened kundalini always tries to move up the sushumna channel and wants to merge with Shiva at Sahasrara. By their very nature, Shiva and Shakti always want to be together. Since Shakti is dynamic power of Shiva, only she moves to create the body or to merge with Shiva who is in the subtle form at sahasrara. OK. Why does Kundalini want to move towards Sahasrara? Let us discuss it in the upcoming post. Next Post: Kundalini Yoga – Part 4: Why and How Kundalini moves? Are you curious to know what happens during Shaktipat? Read an article here with video links. Let us pray the divine parents of the world: Shiva and Parvati (for their kind Grace)! This entry was posted in Kundalini Yoga, Meditation, Yoga and tagged bandhas, five elements, god, grace of guru, hatha yoga, hinduism, indian philosophy, karma, kundalini awakening, kundalini shakti, kundalini yoga, meditation, mudras, muladhara, oneness of shiva and shakti, parvathi, religion, sadguru, sahasrara, shaiva agamas, shakti, shaktipat, shiva, spirituality, tantras, yoga. Bookmark the permalink.